Around the Alps, the following questions are often asked: is it cloudy? If it is and I decide to go up, will I see nothing but near-zero visibility? On an October morning, skies were overcast, but there were some promising clear patches around. Rainshowers over the previous couple of nights down in Garmisch-Partenkirchen town would have been snow at elevations higher than about 1000 metres, which meant all of the “local hills” would be frosted in white. I took a chance and decided to ascend Zugspitze. It’d be all or nothing: a view full of glory, or a view with a whole lot of grey. • Tiroler Zugspitzbahn, aerial tramway from Ehrwald in Tirol, on the other side of the valley in Austria. For the ascent, I rode the Zugspitzbahn railway to Eibsee, and took the aerial tramway up to the summit. Despite the possible snow up top, this was still the “summer season”. The round-trip to the summit costs € 48 per person (summer 2011), which sounds expensive, but as you’ll see in this and subsequent posts, I believe the trip was worth the price. The way up. “Halt auf Verlangen” (stop upon request). Zugspitzbahn, leaving Eibsee station for the summit. 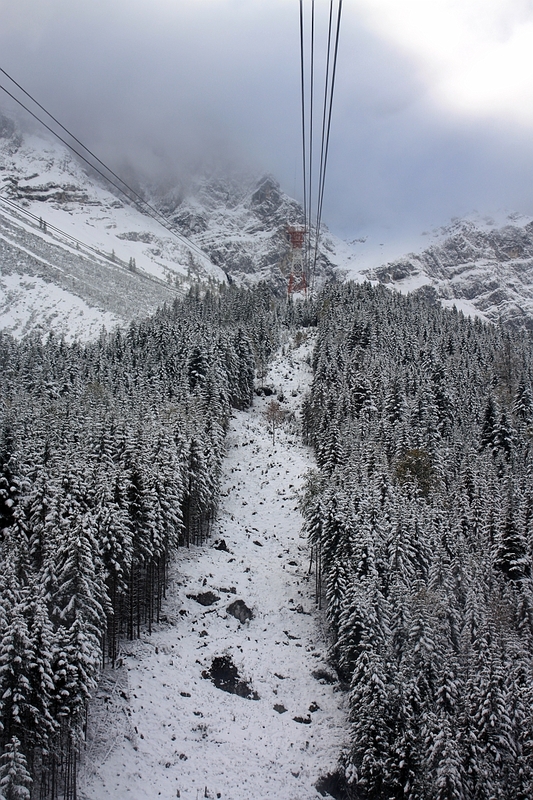 With operations starting in 1963, the Eibsee aerial tramway was designed as an alternative and faster means of ascending the Zugspitze summit. 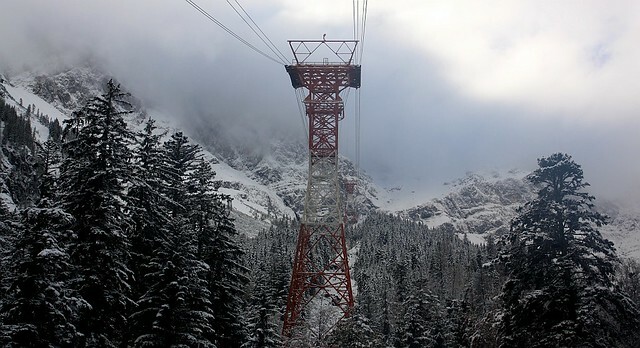 Over the total 4.5 kilometres (2.8 miles) horizontal distance traveled, there are just two pylons or support towers, lifting the aerial tram vertically over 1950 metres (6400 feet) from the lower-station in the valley (about 1000 metres or 3280 feet above sea level) to the upper-station near the summit (2960 metres or 9700 feet above sea level). The height of the towers are 65 and 85 metres (213 and 279 feet, respectively), which makes the latter the tallest cable support-tower in the country. 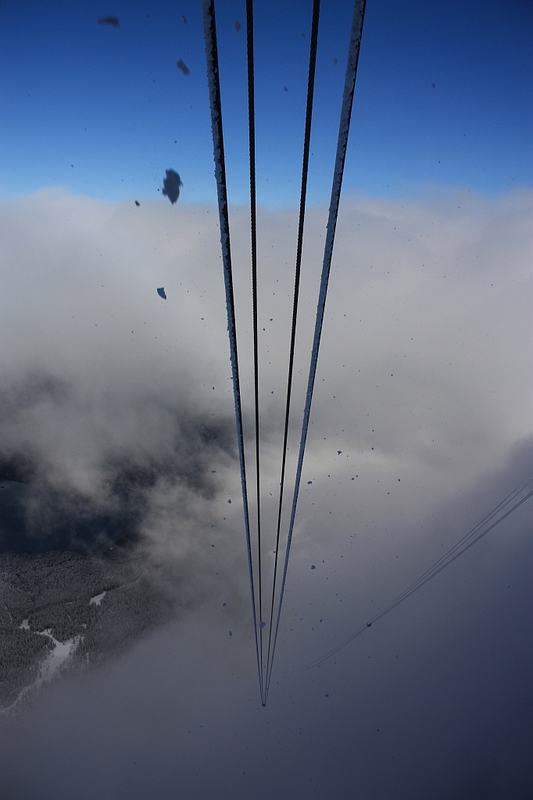 At its steepest near the summit, the aerial tramway reaches a grade of 46 degrees. Eibsee cable car: just TWO support towers over a horizontal length of 4.5 kilometres, a vertical climb of almost 2 kilometres, and a maximum grade of 46 degrees. Looking up from the Eibseeseilbahn Talstation | lower station, Eibsee cable car. On the Eibsee cable car to the first tower. On the Eibseeseilbahn, up to the second tower. 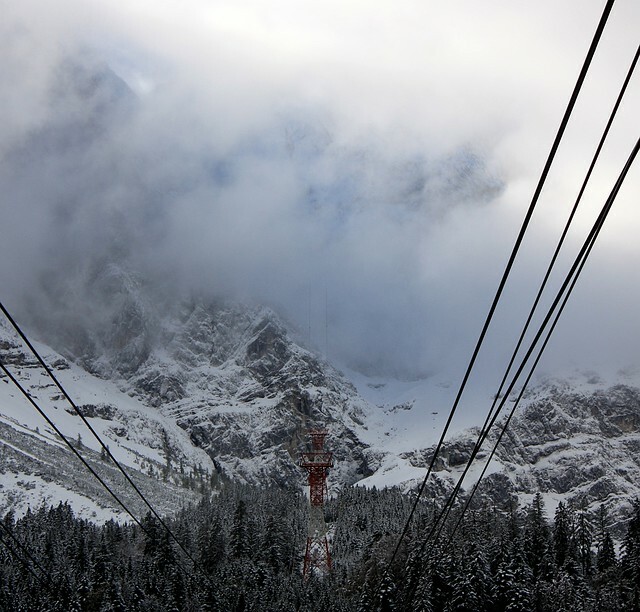 On the Eibseeseilbahn: breaking through the clouds. Past the second tower, looking back down to Eibsee. Ridge along Grosse Riffelwandspitze; ice and snow chunks from the cable. Gipfelkreuz (summit cross) on the Bavaria/Germany side. Towards the frozen Tirolian/Austrian side of Zugspitze. 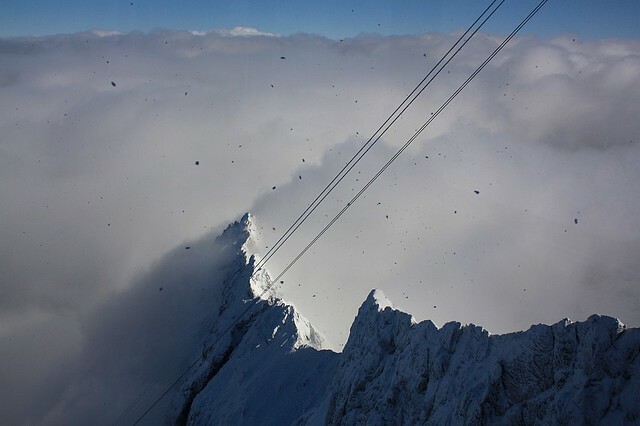 Despite the clouds at mid-level, the chance I took with the trip up to the summit proved very rewarding, as the aerial tramway broke through the clouds and into clear blue skies at the Zugspitze summit. In the next posts, I highlight the exquisite view of the surroundings under a fresh layer of snow. 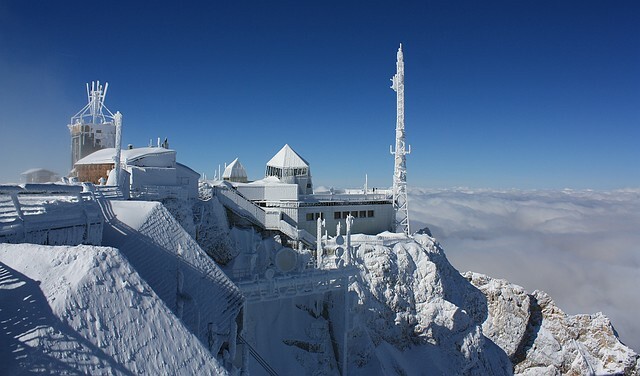 Have you also gone up to the highest point in Germany? Please leave your comments below! I made the photos above on 9 October 2011. This post is published on Fotoeins Fotopress at fotoeins.com. Wow! You are brave, Henry! I never could have managed that trip. Ever! I get dizzy just looking at those photos. And speaking of the pics, what amazing captures! Just beautiful. National Geographic-worthy snaps here. The Eibsee cable car was breathtaking, and had I been really *thinking* about it, I might have been more terrified. Fortunately, the view was spectacular and I kept clicking. 😉 I’m glad the photos managed to convey the steep dizzy climb on the cable car. We went up on the Top of Germany last spring and had such a great time – we took the Eibsee-Seilbahn on our way up, and went down in the Zugspitzbahn. Although the Seilbahn was quite scary, we felt safer there than in the long tunnels of the Zugspitzbahn. Anyway, a great experience and we loved the views! Hi! I might’ve been distracting myself from that steep gradient on the Eibseeseilbahn by continually snapping away with my camera; so, I didn’t really dwell or think about it too much on the ride up. Because the railway goes relatively slowly, the trip down through the long tunnels seems to take a little longer than forever. The whole trip is a lot of fun, especially when the sun is shining up top. Thanks for your comment, and for stopping by! I haven’t done this cable car but have taken many in Switzerland and Austria! Your pictures are beautiful and I am convinced that next time I’m in the area I will ascend to the TOP! Hi, Debbie. It sure would be exhausting but so much fun to chase down and ride all of the cable cars, gondolas, cogwheels, and yodel out loud like the best of them throughout the entire Alps region from France, through Germany, Switzerland, Austria, and into Italy. It would be one tremendous journey, the photographs/videos would be brilliant, and it’d make a great film and/or a book. And yes, I’m sure it’s been done before, but the important thing is we haven’t! Thanks for stopping by my blog, your comment, and your very kind retweet! Loved your photos from the top! Sparkling white snow, clear blue sky and perfect views. 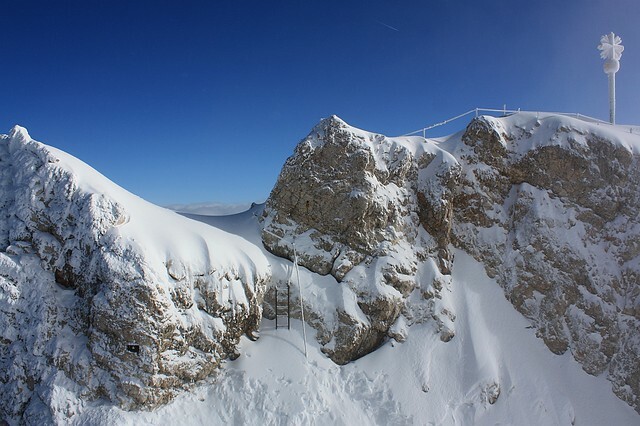 This is exactly the way I’d like to experience Zugspitze! We were planning to go up there just 2 days ago, but finally decided to postpone because of the bad weather. It hardly makes sense, if the only thing you can see on top is the thick gray clouds (especially as the round trip costs almost 50€ per person). Hi! Thanks for your kind comment about the photos! You’re right – I think you have to be sure conditions are right to get the most out of that (50-Euro) round trip. Even if it’s cloudy or foggy on the way up, the goal is the summit. I was very fortunate that the conditions were clear at the top, which I tried to capture through the photos. I hope you saw the entire series of (five) posts for the rest of the photos at the summit. Hola, German! Starting at about +5C in the valley below, the -10C at the summit (not including windchill) was a little rough, but not unexpected. Fortunately, the sun helped to keep things a little milder. Thanks for reading and for your comment!